The Danish composer Carl Nielsen wrote only three concertos during his lifetime: for violin, clarinet and flute. 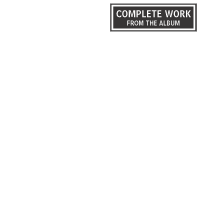 Despite being few in number, they form a significant part of his output as a whole alongside his six substantial symphonies. The three concertos all came into being in the latter part of Nielsen’s life, with the flute and clarinet concertos coming particularly late in 1926 and 1928 respectively. 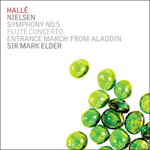 The flute concerto was Nielsen’s first major work following the completion of his sixth and final symphony in the previous year, and was composed for the flautist Holger Gilbert-Jespersen. It was intended to be the first of a series of concertos for each wind instrument, but in the event he was only able to complete two of these projected works. Ill-health had dogged Nielsen for much of 1926 and he had composed very little up to the summer of that year. However, in August, he travelled to Munich as part of a group who were to listen to radios in the city and subsequently advise on the technology that was to be fitted as part of a new radio mast in the Danish city of Kalundborg. In Munich, Nielsen was able to work on the flute concerto, the manuscript of which he had brought with him, and from here he was to travel to Florence and Tuscany where progress on the concerto continued apace before ill-health interrupted once more in September. The concerto was due to be premiered in Paris on 21 October, and with time running short to complete the work prior to the first performance, Nielsen had to assign a temporary conclusion to the concerto for its first performance. The concerto, conducted by Emil Telmányi, was lauded in Paris, despite its incomplete state, and it wasn’t until the end of January 1927 in Copenhagen that the flute concerto was heard complete for the first time, having received a further ‘incomplete’ performance in Oslo in November 1926 under the baton of Nielsen. In referring to the flute concerto Nielsen stated ‘the flute cannot deny its own nature, its home is in Arcadia and it prefers pastoral moods. Hence, the composer has had to follow the mild character of the instrument if he did not want to run the risk of being called a barbarian’. The concerto consists of only two movements, the first an energetic Allegro moderato and the second an allegretto, concluding with a settled Adagio. 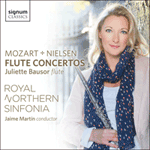 Throughout the concerto the particular nature of the flute as regarded by Nielsen is clear, with emphasis on its idyllic qualities, sometimes almost exaggerated. In referring to the concerto Nielsen described the opening movement as lightly discordant with the beginning ‘if anything, kept in a free, improvisatory style […] the solo instrument moves about as if seeking something, until it takes hold of a more decisive motive’. Heavily featured throughout the concerto is the bass trombone, which, as the direct opposite of the flute, acts almost as a nemesis throughout, providing much lovable humour and interplay between the two instruments. The flute reacts strongly to the series of interruptions and occasionally heated conversations with its opposite number, which eventually lead up to the revelatory moment where the bass trombone, in much the wrong key, unwittingly discovers the resolution of the music, providing an unexpectedly reconciled ending. La création du Concerto pour flûte eut lieu à Paris en octobre 1926, dans le cadre d'un programme entièrement consacré à Nielsen où figurait la Symphonie nº 5. Elle compta entre autres avec la présence de Honegger, qui chanta bien haut les louanges de Nielsen, et de Ravel, qui s'inspira de la partie de caisse claire de la symphonie de Nielsen pour composer son célèbre Boléro. Le Concerto pour flûte était le premier de cinq concertos prévus pour les membres du Quintette à vents de Copenhague, pour qui Nielsen avait déjà composé son génial Quintette pour vents, juste après la Symphonie nº 5. «La flûte, écrivait-il, ne peut pas renier sa propre nature; son royaume est I'Arcadie et elle préfère les atmosphères pastorales.» Pourtant ce concerto n'a rien de fade ou de complaisant. Dès le départ, la flûte doit s'imposer pour réinstaurer I'ordre après les turbulentes mesures d'ouverture de I'orchestre. Et peu de temps s'écoule avant que la nature positive et paisible du soliste ne soit confrontée à la goujaterie d'un trombone de basse en maraude. Comme dans la Symphonie nº 5, mais à une échelle plus intime, le premier des deux mouvements du concerto se résout dans des arabesques poétiques, et le deuxième démarre dans un état d'esprit apparemment simple et positif. Mais le dessin tranchant initial confié aux cordes fait naître I'ombre d'un doute qui éclot plus tard dans le mouvement, menant à un retour déstabilisant du trombone de basse. Dans I'un des instants de caractérisation musicale les plus inspirés de Nielsen—qui lui vint plus tard, il I'ajouta apres la création parisienne du concerto—c'est le trombone de basse qui révèle I'objectif du mi majeur du concerto. Tout ce que peut faire la flûte, c'est exprimer son exaspération devant cette usurpation de son rôle pacificateur. Les deux principaux protagonistes finissent par accepter leurs différents dans la coda—la flûte avec une délicatesse virtuose, le trombone dans un baillement débonnaire. Die Uraufführung des Flötenkonzerts fand im Rahmen eines Programms, das nur aus Nielsens Werken zusammengesetzt war (darunter die Fünfte Sinfonie), im Oktober 1926 in Paris statt. Zugegen waren damals unter anderem Honegger, der Nielsen sein höchstes Lob aussprach, und Ravel, den Nielsens Trommelpart in der Sinfonie auf die Idee brachte, seinen berühmten Boléro zu komponieren. Das Flötenkonzert war das erste von fünf geplanten Konzerten für die Mitglieder des Kopenhagener Bläserquintetts, für die Nielsen bereits direkt nach der Fünften Sinfonie sein liebenswürdiges Quintett geschrieben hatte. „Die Flöte“, schrieb er, „kann über ihr Wesen nicht hinwegtäuschen; ihre Heimat ist Arkadien, und sie bevorzugt pastorale Stimmungen.“ Dennoch ist dies alles andere als ein reizloses oder gar selbstgefälliges Konzert. Schon gleich zu Anfang muss die Flöte eingreifen, um nach den turbulenten einleitenden Takten des Orchesters für Ruhe und Ordnung zu sorgen. Und es dauert nicht lange, bis der besonnen freundliche Charakter des Soloinstruments mit der Flegelei einer marodierenden Bassposaune konfrontiert wird. Wie schon in der Fünften Sinfonie, wenn auch in intimerem Maßstab, löst sich der erste der beiden Sätze des Konzerts in poetische Arabesken auf, und der zweite setzt in scheinbar unkomplizierter positiver Gemütsverfassung ein. Allerdings säht die einleitende stechende Figur in den Streichern Zweifel aus, die später im Satz aufkeimen und zu einer beunruhigen Wiederkehr der Bassposaune führen. Es ist einer der genialsten Einfälle musikalischer Charakterisierung bei Nielsen—eigentlich ein Nachgedanke, hinzugefügt nach der Pariser Uraufführung—, dass es die Bassposaune ist, die dem Konzert den Weg zu seinem Ziel in E-Dur weist. Der Flöte bleibt nichts weiter übrig, als diese widerrechtliche Aneignung ihrer Frieden stiftenden Funktion mit Empörung zu quittieren. In der Coda sind sich die beiden Protagonisten dann einig, dass sie sich uneinig sind—die Flöte adrett und virtuos, die Posaune mit einem gutmütigen Gähnen.